Loren Noveck discovers a previously overlooked reading of As You Like It. Shakespeare’s tragedies and histories are mined over and over again for contemporary relevance and political allegory, but for the comedies, sometimes it seems like enough of a modern gloss just to find a way to land the jokes. While Taming of the Shrew’s gender politics lend themselves to a twenty-first-century deconstruction, it’s rare to see a Twelfth Night or a Midsummer Night’s Dream that gives you a new insight into the play through the prism of today. 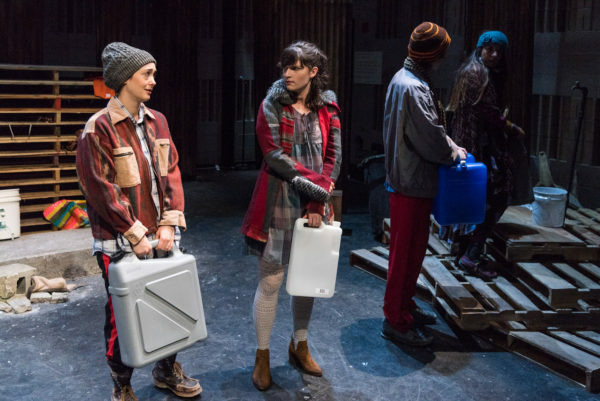 But Arden/Everywhere, director Jessica Bauman’s interpretation of As You Like It, does just that, finding a theme in the text I’d never before considered: the theme of exile. And once you look through that lens, that theme is everywhere. Outside of a few establishing scenes early in the play that are set at court, the piece’s characters are all people cast out from their homes, living in the Forest of Arden in a community that is provisional and strange, in a sort of suspension from the world and from normal society. Suddenly, in this light, a modern analogy is clear: almost everyone in As You Like It is, at least temporarily, a refugee. Compounding the metaphor, this Arden (in Gabriel Hainer Evansohn’s elegant set) is camp as much as forest, formed of stacked wood pallets and corrugated metal, littered with potentially re-purposable debris, and serving as a soccer field as often as not. The only structure is a shack that serves as noticeboard, general store, cellphone charging station (when the generators are working), community center, and everything else. And Bauman has also assembled, with real thoughtfulness and care, a cast that mingles experienced, international professional actors with students and an ensemble of young immigrant performers from around the world; the group of sixteen is both multiethnic and multilingual, weaving other languages, songs of other cultures, and sometimes their own personal stories of immigration, exile, and belonging into the piece. Too, the absurdity of the lengthy central section of the play, during which a confused but resigned Orlando woos Ganymede-qua-Rosalind until she finally confesses the truth literally at the altar (her own father hasn’t recognized her heretofore either), is almost impossible to transcend. Cason and Cespedes give it their best shot, though. Cason embraces Orlando’s bafflement, and Cespedes gives Rosalind a charming air of constant improvisation, more effective in her scheming than when she’s moping after Orlando, which leans a little too melodramatic. Strong performances and the strength of the central conceit make the piece well worth watching. There are also some wonderful comic turns in the smaller parts–Alessandra Mesa as Audrey, who mostly speaks irate Spanish to a baffled Touchstone but nonetheless they gain something from each other’s company. Indika Senanayake is a marvelously cranky, over-the-top Phebe. Kenneth De Abrew’s Corin, conceived here as the all-purpose camp “fixer” with a finger in every pie and a solution to every problem for the right price, is the heart of the camp, the engine that keeps its creaky machinery running. But in the end, it’s not the romantic yearnings that stick with you from Arden/Everywhere–it’s the more inchoate and deeper yearnings for home, for safety, for family. The piece begins and ends with tableaus of parting; in the beginning, it’s refugees beginning their journey to the unknown. At the end, it’s Rosalind, Celia, the Duke, et al. returning home–a happy ending, for them, but a bittersweet one for those left in limbo. Arden/Everywhere runs at Baruch Performing Arts Center until October 28. Click here for more details.